I remember our youngest son’s senior year in high school and the dilemma we found ourselves in. In his eighth grade year, I began a diligent search for the best colleges. I think my entire office floor was filled with pamphlets and applications. I’m not one to put all my eggs in one basket, so, I made a concerted effort to apply to other schools. I must admit, we had our hearts set on the Academy. By December of Aris Joseph’s senior year, we hadn’t heard a word and we began to worry. Aris and I are cut from the same fabric. Neither one of us wanted to show how anxious we were about his being accepted to the Academy. Aris took sick one day and stayed home from school. He had the flu. I made him soup, pampered him, and hoped I wouldn’t catch it. That same day, about 11 a.m., we received an Air Express letter in the mail from the Academy stating that Aris had been accepted. A week later, we found out he had not. See, the Academy’s left hand had no idea what its right hand was doing. Aris had been diagnosed with asthma as a child. We disclosed this on his application. The Academy became skittish, backed out, and left my child disappointed. Our anxieties were tremendous. In the back of my mind, I wondered before the Lord, “if this is not to be, then why the drama?” But when I knelt before God, I said, “I don’t know how you do what you do, but I know that you will somehow fix this.” Still, I wondered. I did everything I could to encourage my son, emphasizing that God would make a way. In the meantime, February was approaching, and the school would soon have “Signing Day.” I wondered what would happen. Here we were, not intending for the Academy to mean so much, but it did. All other college acceptances didn’t mean a thing to us. We ended up trapped in our own desires. I was skeptical. I said to the recruiter, “Look, my son has already been disappointed by the Air Force Academy. I’m not letting you guys do the same thing. Aris has asthma. The Academy wouldn’t take him, so, if you’re coming to my home to throw around some half-cocked promises you don’t mean, forget about it.” He assured me he was serious, so serious that he had already looked up Aris’ transcript and was very impressed. He couldn’t believe the child hadn’t made a “C” in his life. After visiting West Point with his father, Aris was hesitant at first, but quickly realized West Point was where he was supposed to be. My husband and I couldn’t believe we hadn’t considered West Point, especially since we’re an Army family. My husband served in the Army, then the Army Reserves for many years. “Signing Day” arrived before we got word if Aris was accepted into West Point or not. He had to go through a battery of test because of his asthma. Anxious about Signing Day, Aris asked me this question: “Mom, should I attend ‘Signing Day’ and do a ‘mock signing’ in hopes I get accepted?” He and I thought about that question very deeply. I told Aris, you could, but how will you feel if you aren’t accepted. How will you live with the aftermath of that? And more importantly, have you really been accepted? Aris decided to attend Signing Day, but only to congratulate his teammates on their accomplishments. What a bummer. I felt happy and sad. Happy that Aris made the right decision. Sad because here was a hardworking young man having to deal with life’s defeat, and he wasn’t even 19 yet. This emotionally drained me. After all, I had prepared for four straight years and in every way possible for my baby’s senior year. I had no intentions for it to end up like this. Besides, we still had to make a decision on another college. We had applied to Columbia University. That was my next big hope. We got a letter from Columbia saying they had a record application year and had to decline many for admissions. I could have kicked myself for not applying a year earlier. I kept the letter to remind myself all my efforts weren’t in vain. After all, I thought, they weren’t rejecting Aris because he had bad grades or because he had not met their school criteria. Aris was and still is a very diligent young man. 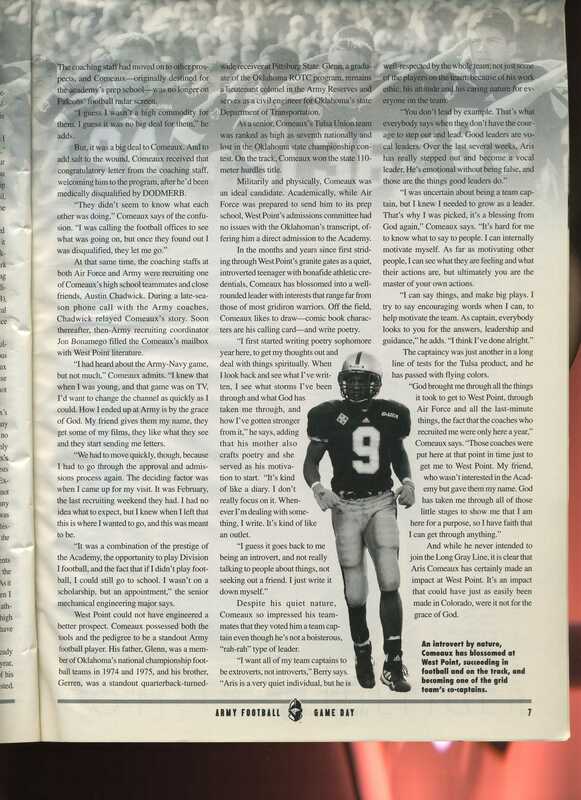 He had put a lot of effort into his school work and on the football field. 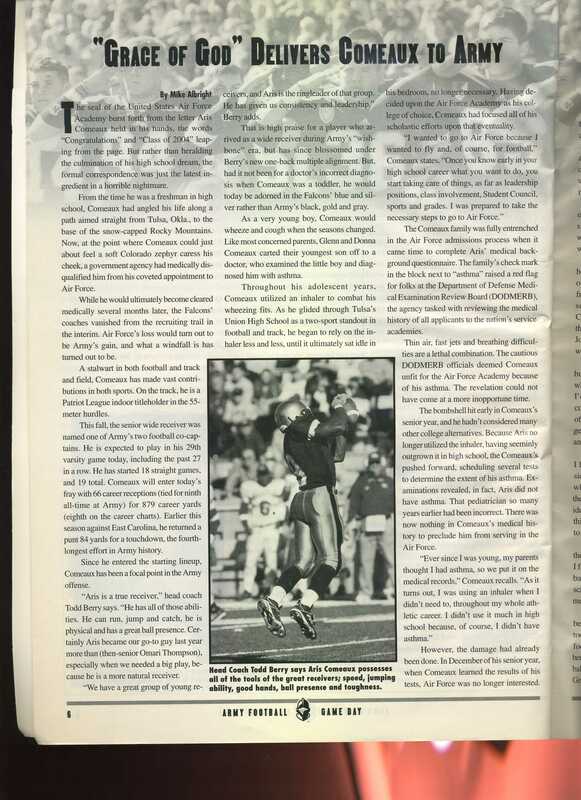 As a wide receiver, he caught unbelievable passes in the end zone and gained more yardage than we ever expected. When he first started in Tulsa Union’s football program, he was little. Coaches thought he’d do them a favor and quit so they wouldn’t have to cut him. They underestimated Aris’ drive and determination. “Hash Mark,” a nickname the coaches gave Aris because he was so tiny, hit the weight room and never looked back. He was on a team with unbelievable talent. Competition was fierce. And yet Aris made his mark, taking his place on the Wall of Fame at Union High, and winning the State Championship in hurdles. When the college of his dream didn’t come through for him, you can understand his quiet disappointment. But one day, we not only got a telephone call, we received a letter in the mail. It happened in April, long after Signing Day. Glenn, my husband, went to football practice and waited for Aris to take a water break and he broke the news to him. Aris Joseph had been accepted into “West Point.” I wasn’t there. I let Glenn have the honor of telling his son the news. But I will never forget what Glenn told me Aris’ response was: “Can I be happy now?” Wow! He had held all that pain, anxiety, anticipation, and hope deep inside his soul and now he wanted permission to let it out. What jubilee!! Waiting on God can be taxing on your nerves. He waits too long to answer prayers. Sometimes, we misconstrue His silence, thinking He has not granted us all that we’ve asked for. Too many times we lose hope and take matters into our own hands only to mess it up and create more grief for ourselves than necessary. Psalm 37:6 tells us: “Commit your way to the Lord; trust in Him and He will do this: He will make your righteousness shine like the dawn, the justice of your cause like the noonday sun.” You think Aris Joseph’s ‘cause’ ended up resembling “the noonday sun?” You bet it did! 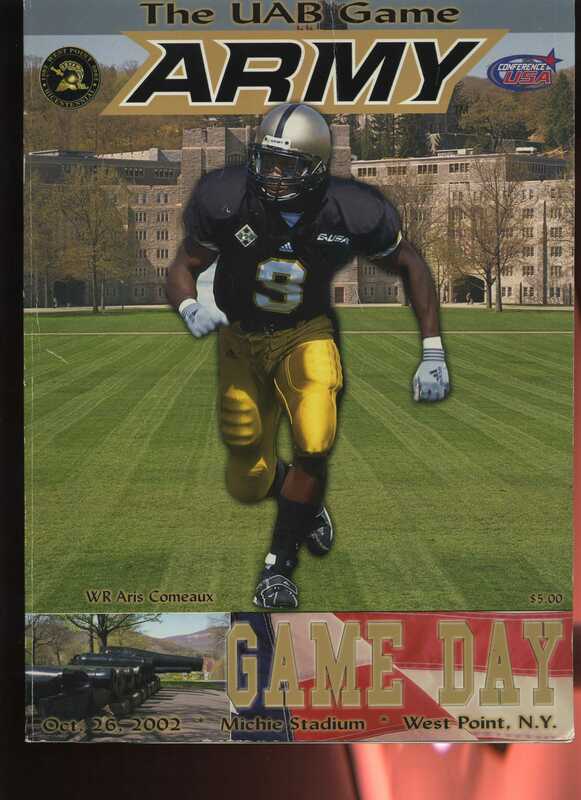 West Point was the very best choice for Aris. And the amazing thing about our journey is, though West Point wasn’t on our radar screen, God knows best. The only thing required of me and my family was to wait on God. When you are called to wait on God, don’t dare think you know how it’s going to play out. We don’t. We only know that we will be victorious through Christ Jesus. That’s it! We don’t need to know what God knows. We don’t need to know ahead of time what we should say, where we should go, or who we should meet. We only need to walk in the ways of our God and let Him handle the rest. During stressful trials, sit still and remember all the sticky situations God has pulled you through, instead of filling your heart and mind fretting over what should and could be. Fretting will only open you up to sin. So, relax, and let God. He, after all, has your best interest at heart. Ask my family. We can testify to this. Though all things will pass away, God is kind, in this life and the next. Pray for what you want. Be prepared to wait. And expect a blessing. NOTE: To get a better feel for Aris Joseph’s journey to West Point, scroll down and read the article below. It’s a great testimony of God’s goodness!!! By dcomeaux in Blog, Religion on September 17, 2013 .